Installing a sub panel in a detached garage makes it convenient to turn the electricity off and on when needed. A sub panel is just another name for a breaker box. You do not want to have to go all the way down to the basement when you need to shut the power off in the garage. The first thing to think about is the size of voltage sub panel you'll need. 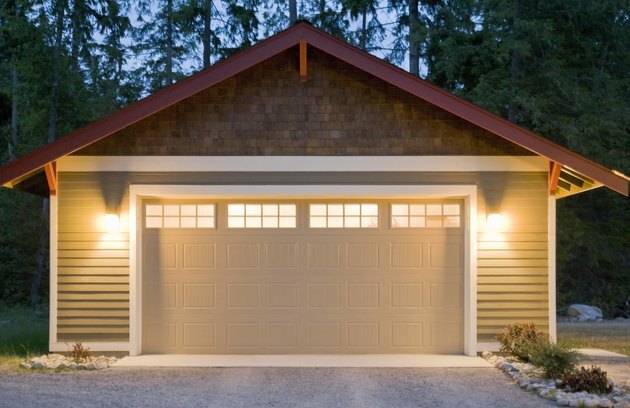 This depends on how much power you typically use when working in your garage. If you are running welders and compressors that require high voltage then you will need a 100-amp sub panel. If you are just doing small jobs then you will only need a 50- to 60-amp sub panel. The most common outbuilding sub panels are 60-amp. Installing a main breaker into the sub panel will save you the headache of having to go to the main panel box to shut the power off. If you do not have and will never have a phone cable, gas line, water lines, computer cable or TV cable in the garage, you only need to run a red, black and white wire from the house. The sub-panel can be grounded at the garage. You will have to install a 6 foot ground bar outside the garage and run a ground wire from the sub-panel box to the ground rod. The ground wire does not have to be in a conduit. Remember, you're working with electricity, so follow good safety procedures. The National Electrical Code (NEC) requires the installation of ground fault circuit interrupters (GFCI ) for any outside wiring. Use rubber insulated gloves when working with electricity. Never work in the panel box when it is "Live." If you do not use a GFCI breaker or receptacle outside you could get seriously shocked and start a fire. Dig an 18-inch deep trench for the outdoor electrical wire, which you will run from the main panel box to the garage sub panel. Use 1 1/4-inch PVC conduit for a 100-amp sub panel or 1-inch PVC conduit if the sub panel is 50 amps or less. Run the conduit from the garage to the main panel box. If concrete has not been poured in the garage, run conduit down into the ground on the inside of the garage. Use a 90-degree sweep connector, instead of a sharp 90-degree connector, to make it easier to pull the wire through. If the concrete is already done, run the conduit up the wall on the outside of the garage and use a PVC LB access fitting to go through the wall where the sub panel box is to be mounted. Do the same at the main panel box. Screw a piece of plywood that is 6 inches bigger then the sub panel to the wall where the sub panel will be mounted. This is called a backer. Screw the sub panel box to the center of the backer and connect the conduit to the sub panel. Some local codes require the backer to be painted black. Use #8 THHN wire for a 50-amp sub-panel or #2 THHN wire if the sub-panel is 100 amps. Run the wire from the main panel to the sub-panel box. Run black, red, white and green wires from the sub-panel box to the main panel box. If the weather is cold outside, keep the wire inside to keep it warm. The wire will be easier to work with if it is not cold. In the sub panel, connect the red and black wires to the main lugs on the top of the main buss. Connect the white wire to the neutral bus bar, located along the side of the main bus, and connect the green wire to the ground bus bar, which is connected directly onto the sub-panel. In the main panel box, install the breaker into the main bus. Connect the red and black wires to the screws on the breaker. Connect the white wire to the neutral bus bar and the green wire to the ground bus bar. Test the sub-panel with a voltage meter to ensure it has the correct amperage. Replace the panel box covers and turn the garage breaker on.